Both of the boys are back in school and full time now. I have a fourth grader and kindergarten kid in the house. For three days now, JSL has cried at drop off. Thursday was a little different since he went in about 40 minutes late after an ENT appointment. We have found something that seems to help at least a little (unless his teachers tell me otherwise). 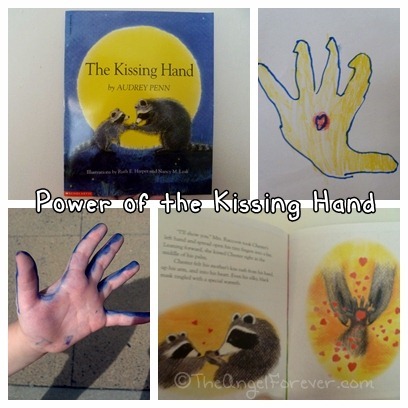 We implemented The Kissing Hand technique thanks to the book by Audrey Penn. Each morning, when I drop JSL off, we power-up our kissing hands to make sure we are both ready for the day away from each other. JSL’s blue outlined fingers were from making his own kissing hand. I may not be Mrs. Raccoon and JSL isn’t Chester, but this may be a great tradition that works for us at the start of a new school year, or a day he’s nervous or sad. Do you have any traditions or items that you have done to help your kids to ease into the school routine? If you do not have children, what helped you as a child? What a great idea! I never had a problem with my boys and separation for school. No traditions here for going off to school. Have a great weekend! My daughter is reading this book too. What a great idea! We never had a problem with any of the kids. In fact I can’t think of a single kid in our family who did. Too cute. We really never did anything special except the first day Mommy took them ( bus or no) and it was fortunate that my two oldest was close in age, and my two youngest were close in age. There was a gap in the middle because I lost a child in between the four. The only thing we did was a week before school started I started them getting off to bed at school time instead of summer time to get use to that. 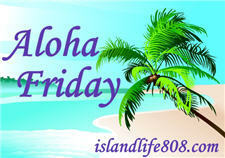 Xmasdolly´s last blog post ..Friday Photo Flashback Friday & Aloha Friday & any others I find. I really can’t think of anything at the moment. Harriet´s last blog post ..Can you believe 9-11 will be 11 years old next week?